During the last years interest to cigars has increased considerably and their smoking transformed in fashionable fancy. More and more popularity among lovers begin to acquire cigars from Dominican Republic, Honduras and Nicaragua. At all times cigar was a symbol of success, power and financial soundness. A good cigar of hand rolling costs not less than 15 dollars, humidor - (box for keeping) - from 100 dollars up to several thousands. However for wealthy connoisseurs of cigar such amounts are not the limit. Beginning with March 2000 world-famous London auction Christie's begun to conduct exclusively cigar actions (before cigar lots were offered for sale together with wines). Trigger price for some examples can reach 290 pounds sterling (more than 500 dollars) for one cigar. 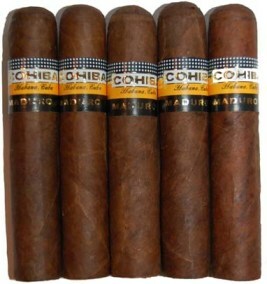 Leader of the rating of the most expensive cigars of the world are Cohiba 30 Aniversario, produced in 1996 in limited series (45 humidors per 50 cigars in each). Entire set has certificates; all humidors are enumerated (from 1 to 45). Besides, these cigars distinguish with special format - Robusto Especiales. Their length makes 192 mm (while the length of classic Robusto cigars is equal to 124 mm). One of boxes of these cigars was sold in 2001 on Christie's auction for 14300 pounds sterling. The second place in this rating takes Trinidad Diplomatic with Fidel Castro signature. Trinidad cigars were not previously presented in large sale but were produced exclusively for diplomatic gifts. Later they began to be sold on auctions. In 1999 box of Trinidad Diplomatic with Fidel signature was bought for 13200 pounds sterling. Special attention deserve cigars "1492" that occupy fifth place in the rating. They can be rightly named "classic of all the times". They were made on Cuba in honor of 500th anniversary of discovering America by Columbus - just 501 humidors per 50 cigars in each. Each cigar's band has its own index number. First humidor with number 0 is in personal collection of Fidel Castro. Cigars with number 500 are stored in National Museum of tobacco in Havana. In 2000 on Christie's auction price of these cigars has made 11500 pounds sterling. Besides pleasure from quality cigar's smoking real connoisseurs see in buying auction exemplars also a good investment. Prices on cigar rarities grow with each year of their life.